From being the top turkey producing state to housing the companies that supply and distribute most of what’s on the table, Minnesota plays a large part in the Thanksgiving process. There’s a lot more than mom’s cooking to make Thanksgiving a success. To ensure every family has what they need to put together the traditional Thanksgiving meal—from the turkey filled with stuffing and cranberries to the mounds of sweet or mashed potatoes, greens and, of course, pumpkin pie—Minnesota-based grocery retailers, transportation specialists and agricultural companies plan out months—if not years—in advance of the holiday. The combined effort requires a concentrated coordination between all parties. In Minnesota, that means food companies like Cargill, Jennie-O Turkey, General Mills and others are coordinating with shipping companies like CH Robinson to make sure supplies of Thanksgiving essentials reach stores run by Supervalu and other grocers. Each company involved along the way told TCB the weeks before and of Thanksgiving each year are some of the peak times of activity. So how much planning and extra effort goes into bringing that Thanksgiving meal from farm to truck to store to table each year? No Thanksgiving meal is complete without the quintessential turkey. Since 2003, Minnesota and its 450 turkey farmers have been the top turkey producers in the nation. Approximately 44 million, or 18 percent, of all turkeys raised in the U.S. specifically for Thanksgiving will come from Minnesota farms. > The turkey industry employs roughly 25,000 people in the U.S.
At the farm, turkeys are often raised between four and eight months before being harvested. While most are frozen, others raised later in the cycle are butchered near Thanksgiving to be sold fresh at a premium charge. “The weeks leading up to Thanksgiving is what we call fresh bird season,” Cargill’s Martin said. In terms of demand, both companies said they experience a significant increase in whole bird sales during the week before and of Thanksgiving. But, the Thanksgiving turkey craze drives up more than whole bird demand as turkey byproducts receive a notable sales uptick, too. While the turkey may be the centerpiece of the table, the dishes surrounding it go hand-in-hand in crafting the full, authentic Thanksgiving meal. When it comes to perishables like green beans, potatoes and cranberries, CH Robinson subsidiary Robinson Fresh takes on the critical role each year of distributing must-have produce items. Predicting what will be the must-have fruit or vegetable during a particular Thanksgiving is something Jim Lemke, president of Eden Prairie-based Robinson Fresh, and his team starting to gauge months ahead of time. Lemke noted that Robinson Fresh works with famers early on to stagger the growth of certain crops throughout the year, so as to achieve volume goals come Thanksgiving time. “From a volume standpoint, the week before Thanksgiving is one of the busiest weeks,” he said. Of Robinson Fresh’s 30 offices and facilities across the nation, the company might require 25 percent more temporary help to handle the increased volume, Lemke added. The produce Robinson Fresh distributes will take about two to four days to ship from the west coast, particularly California, Arizona and Mexico, to its customers throughout all of North America (as well as other countries). Stores that receive the company’s foods run the gamut, from big name grocers, to wholesalers, as well as smaller format convenience stores and produce markets. “On a national scale, we’re doing business with 58 out of the top 75 retailers,” Lemke said. In Minnesota alone, Robinson Fresh does business with 32 companies, or roughly half of all major produce vendors. General Mills’ array of Thanksgiving foods not only translates to increased sales, but higher-than-usual web traffic, as well. On the Thanksgiving Day, Siemienas said the company’s websites are busier than almost any other time of year, as millions of people flood its pages in search of new recipes. 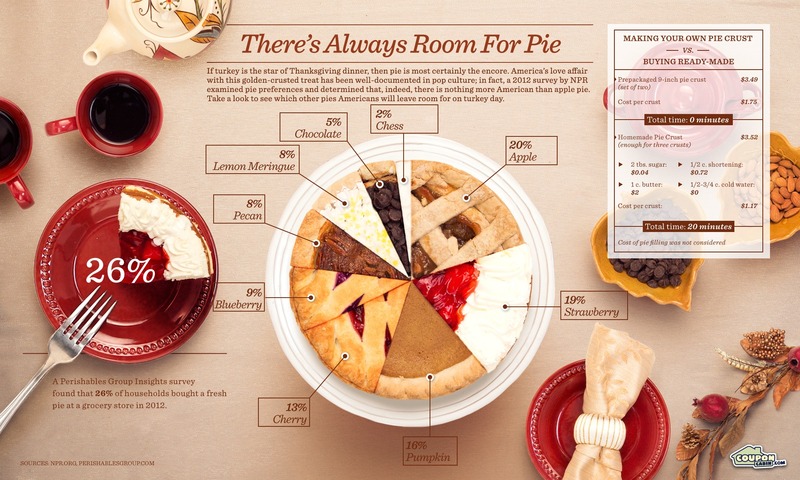 For every turkey eaten on Thanksgiving, Americans consume about one pumpkin pie. According to the American Pie Council, about 50 million pumpkin pies are served each Thanksgiving. Nevertheless, pumpkin pie, despite being served at the Pilgrim’s second Thanksgiving in 1623, is not America’s favorite. According to a survey by National Public Radio, one out of five Americans prefer apple pie as their dessert. That was followed by strawberry (19 percent), pumpkin (16 percent), cherry (13 percent) and blueberry (9 percent). Despite the dominance of fruit among America’s pie preference, Robinson Fresh said it only sees a slight uptick—just over 10 percent—in demand for berries, such as blueberries and blackberries. So when it comes to homemade pies, most Americans opt for canned filling. Many more buy an already-prepared pie that’s ready to serve, no baking required.